National Institute of Health Jobs have been announced recently in order to improve institution’s efficiency and effectiveness as well. In order to maintain the transparency and meritorious standards during recruitment process NIH has given this crucial responsibility to Open testing service (OTS). Eligible Candidates are required to apply through Open Testing Service (OTS). 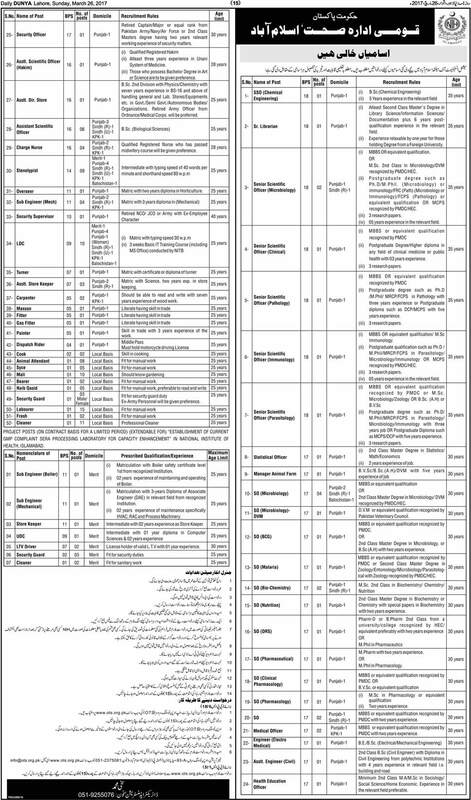 There are around about 100 vacancies available in National Institute of Health. Candidates from all over the Pakistan that is Punjab , sindh , KPK, Balochistan and Gilgit Baltistan are strongly encouraged to apply upon these said positions. Female candidates are also advised to apply. There are more than 60 disciplines in which numerous vacancies are available according to their requirements and specifications as well. The posts which have been advertised going to start from BPS-01 to BPS-18. Aspirants can apply more than one post but only they have to download separate application form for that one. Application form and all miscellaneous instructions are being given on this page as below with complete guidelines accordingly. National Institute of Health is one of the most prestigious institutions of the country involved in multi disciplinary public health related activities like diagnostic services, research and production of biological for the last more than forty years. There are certain important instruction are being given below regarding National Institute Health Jobs. Age relaxation shall be admissible up-to 5 years according to prevailing recruitment rules of federal government. All Government employees shall apply through proper channel. No TA/DA shall be given to Candidates for test or interview. Concerned authority is fully authorized to cancel the recruitment process at any stage. All Candidates must read carefully the instructions given on application form accordingly. Incomplete or applications submitted after due date shall not be entertained as well. Educational Eligibility criteria is required as following level with respect to concerned discipline mentioned in advertisement for National Institute Health Jobs. Following is the simple procedure to apply on National Institute Health of Jobs accordingly. Applications along with fee chalan are available on the official website of OTS www.ots.org.pk. Candidate must Deposit Fee as prescribed on the application in specified bank. After Depositing the fee application must send to OTS headquarter along with fee deposit slip. Deadline for the Submission of Application for National Institute of Health Jobs is 9th April,2019. For Getting further information regarding test date and list of eligible candidates as well as for test and interview shall also be displayed here forthwith.